For 90 years, UNC Asheville has been the creative and intellectual hub for a region inherently innovative and inspiring. 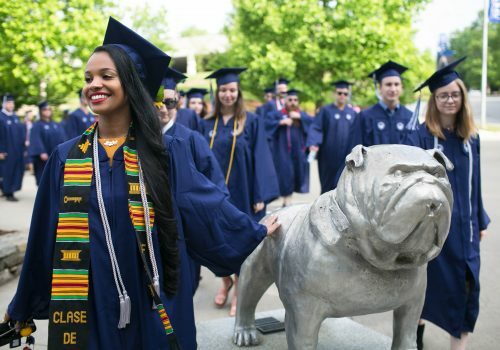 Take a look at some of the campus traditions, symbols and events that bring us Bulldogs together each year. The bulldog has been the UNC Asheville mascot since the 1930s. The Rocky statue was sculpted by Matt West ‘00. Tradition holds that students should pat Rocky’s head when they arrive as freshmen, for good luck before an exam, and when they graduate. Created by local engraver Harry Sage in the 1930s, the UNC Asheville seal depicts Mount Pisgah, the Latin phrase Levo oculos meos in montes (“I lift up my eyes to the mountains”), the name of the university and date of its founding. You can find the engraved seal by the flagpole on the Quad. UNC Asheville faculty and staff welcome new and returning students in August by helping them move into the residence halls. Following move-in, new students attend Convocation in August, the official ceremony marking the start of the academic year. As students make their way to the ceremony in Kimmel Arena, they pat the statue of Rocky, the UNC Asheville mascot, for good luck and a successful academic career. Held after Convocation to start the new academic year in August, Rockypalooza is a night of great food, games, entertainment and fun for the campus community. And it’s a good time for all students to reconnect and meet new friends. Initiated in the fall of 1997, Founders Day celebrates UNC Asheville’s beginning in September 1927 as Buncombe County Junior College and its entrance into the University of North Carolina system in 1969. It features speakers, dedications and special events. When the maple trees that line the sidewalks of the Quad turn brilliant colors in mid-October, the university community gathers to celebrate autumn in the mountains with cider, cookies, conversation and fun. Originally known as Rockmont for the campground where it was held, Lawn Party on the Quad offers food, rides, games, comedians, concerts and other entertainment to celebrate the end of the academic year. It’s the last hurrah before final exams in the spring. Homecoming is held in the fall to highlight UNC Asheville Bulldog spirit and accomplishments. The three-day celebration includes athletic events, alumni reunions, a dance, a parade, and other festivities commemorating UNC Asheville. Held in April, Greenfest is a collection of events, programs and lectures celebrating environmental awareness and campus beautification and activities that promote recycling, walking and riding bicycles and public transportation. Highlights include tree plantings, roadside trash cleanups, trail maintenance and other ways to protect the environment. While the university is closed for the national Martin Luther King Jr. Day holiday, students, faculty and staff are encouraged to provide a day of service to the community by helping local organizations. During exam weeks, faculty and staff serve up a big breakfast for weary students in need of a study break and a good, hearty—and free—meal. Held late at night in the Dining Hall, it’s a popular social event featuring friendly conversation and the ever-popular karaoke. At this formal academic ceremony held in May and December, students receive baccalaureate or master’s degrees, the chancellor confers honorary degrees, and the university presents the top faculty and student awards of the year—including the Manly Wright Award to the senior deemed highest in scholarship, who receives their diploma on a silver platter. As seniors march into Commencement, the alumni bell is rung five times for UNC Asheville and its four predecessor colleges. The bell is also rung at the end of the commencement ceremony and on Founders Day.